If you have been a reader of the site before, you’ll know that I used the concepts from the Bulletproof diet and a lot Bulletproof coffee to help put me into nutritional ketosis and lose a bucket load of weight. That sent me down the should I be checking for ketones, but also thinking well if I’m eating (and drinking) so much saturated fat have I reached and maintained a level of nutritional ketosis? I really wanted to know too as nutritional ketosis (not diabetic ketosis!!) is meant to be the place where your brain is meant to work better. It is also the place where, if you do suffer epileptic seizures, that it helps to reduce the frequency of them. Now I don’t have epilepsy, but I do like the idea I am helping my central nervous system function at a better state. Use “BIOHACKER” to get a discount at checkout – valid until the end of July 2017. I think a lot of people try guess when they have hit the magical place called nutritional ketosis. However, we learnt from ketone researcher Dr Brianna Stubbs interview that the three ways to measure ketone levels are using either blood strips, urine testing strips or breath acetone levels. Measuring acetone levels in your breath is the new kid on the block for testing ketone levels..
Now I think that is awesome not having to prick or finger all the time and also saving on not buying ketone strips from a pharmacy. Listen to Michel Lundell’s interview on episode 14 of the Biohackers Lab podcast. He explains from his tests why he feels measuring breath acetone levels is better than beta-hydroxybuytrate levels. 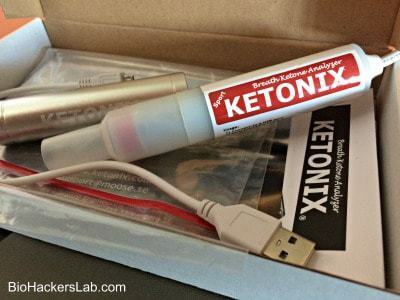 Below are great visual overview of the differences between blood ketone testing and Ketonix. This was also written by Michel Lundell, the inventor of the Ketonix. Here is a longer presentation looking at testing breath acetone levels vs beta-hydroxybutrate blood levels when trying to determine nutritional ketosis state. Check out my video of me unboxing of my then new sport version of the ketonix breath analyser with the optional battery pack. N.B. The company has since done some changes and you have an option of a red or blue ketonix stick now. Still, this video I feel will help you know what to expect in your parcel when your arrives in the post. If you don’t know too much about the development of the stick then click here to listen to the inventor, Michel Lundell, on episode 835 of the Livin La Vida Low Carb Show with Jimmy Moore. Like you saw I had the old “sport” version which is more sensitive in showing how far into ketosis you are than the standard one. The standard is called “Ketonix Blue“. Struggling to decide which one to choose? Either one is a perfect choice for anyone who is starting out on a ketogenic or low carb high fat diet. Personally I thought, well if I’m going to get one for the whole family to use (wife and child too) I see it as a long-term investment so why not go for the one with a bigger range of values. Both work the same way and charge up the same way using the usb battery charger. So for a little bit extra just get the top of the range and unlock all features possible. 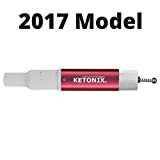 For US and UK based biohackers you can easily shop online at Amazon for either the Ketonix Blue or Red with the battery charger by clicking one of the boxes below to get taken to the store page. (If you live outside the US/UK click on it anyway as it will try find if there is a ketonix store listing on your local country Amazon store too). For the rest of the world like biohackers in Europe and Scandinavia, South America, Australia and South Africa you may have to go through Moose engineering’s’ website here to find a local distributer. If the link above doesn’t take you to your local Amazon country store with the item there for you. From April 2017 there is a new device that will allow you to sync your red or blue stick to your phones app via Bluetooth. This will help with tracking your data in the app. Occasionally I have seen a valid ketonix coupon becoming available for short periods of time from the manufacturer in Sweden. The website link isn’t working for me. Could you please provide another? I can’t find it by Googling “Moose” engineering as there are too many of them. thanks for your help. Thanks for the heads up I have updated the link. They have changed their website links and have rebranded the sport to “KETONIX 2015 RED” with or without battery. Thoughts on the new bluetooth model? I just interviewed Michel Lundell the founder of Ketonix today for an upcoming podcast episode. He took me through the new device which looks like a big improvement. I’m getting a new Bluetooth version delivered to me so I can take it for a test run to compare. From what I learnt and saw today, it is much better then the older version that I still have as the new app that links up makes analysis & tracking much more useful. Did he mention if the app links into Apple Healthkit or Google Health? Currently the app doesn’t, but he did say that it is in the development features pipeline. So I didn’t get an ETA for you. Whats the functionality difference between the red and blue? The amazon link is dead. Any news how the best way to get this if you’re in the states? Any ideas if the 2017 model is improved? Also, do you happen to have any new coupons?! The newer version comes with software that you can install on a PC or Apple Mac. I’m not sure about any change in sensitivity testing ability on the older vs newer models. I’ll see if there are any deals to be had, but at the moment I don’t know of any other coupon codes. As of August 4, 2017, Ketonix for North America lists the 2017 model as back ordered by about a month. They don’t list the Bluetooth one at all. When I contacted them they said they do plan on selling the Bluetooth version but are waiting until they clear their backlog of the 2017 USB version, first. Even the Swedish & International shop website lists the Bluetooth version as being back ordered so I think it will be some time before they are available to the general public regardless of where you live.